This topic will cover the whole build up of the car and all the events leading up to the Daytona 2006 Show. I must say I am happy with the outcome of the show, and one not to be a sore loser, I looked and saw the minute mistakes to correct for next years show (??? ) First Place Custom Fiero was a great award and I am glad the work my father and I put forth was recognized by the judges. 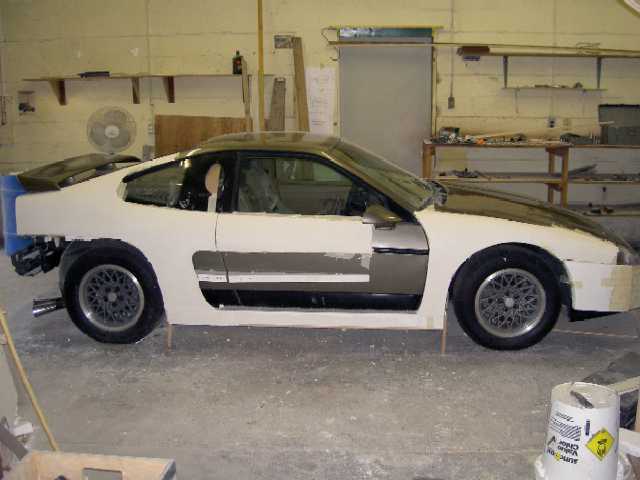 I will list all the fiero vendors we used to get this car done, although most of the parts were hand-made, without these guys it would have made it alot harder. I want to thank everyone for the positive feedback and am looking forward to opeing the pages to this chapter of our lives, headaches and sucesses to the Fiero community. If there are any questions please ask and all will be answered. There's two types of cars in the world, Fieros and everything else. Okay, let me begin, hehe. Nice car btw. 3. Rear wing....Carbon fiber or coated? wing coated with the paint used on the ford Mustang Mach 1, that semi black. age, etc, how you got into fieros, your goals, and some of your inspirations for the project ? The car started out as a stock 87 GT all power etc. Ran great and originally owned by a local Pontiac Dealership owner, Mr. Marlow. 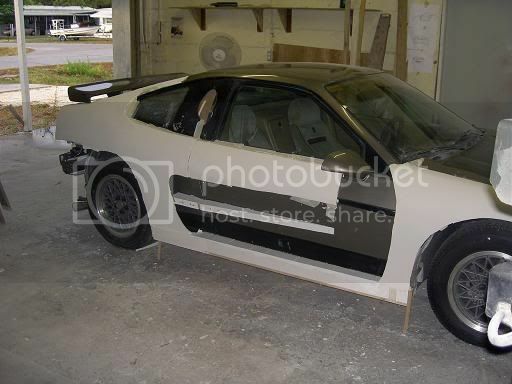 My fiero experience began when we decided to make a Lamborghini Replica, this being the only car we could find in the area we bought t even though it was not for sale. after own for about 2 months and driving it we decided it was too nice for cutting up and making a fake Lamboghini. Well my name is Alexandar Bojidarov Alexiev and currecntly living in Florida. I am 19 now and have been living in the USA for 9 years. I moved from Bulgaria, lived in the capital, Sofia. I got really interested in fieros when my love for lamborghinis subsided due to the high costs. Hasn't everyones? I would love to own one but whose got the money, right? Anyway, I wanted a mid engine, 2 seater, with a degree of exclusivity, and there the fiero was the perfect car not only to own but the great donor for a lamborghini. Well I got over that too and after talking with many people and one of the most valuable resources became a family friend Fransisco Vilalba, a Equadorian native who told me, anyone can make a copy of something, it may look good but it never is the real car, make something from your imagination, something unique, something nobody has. As you can see thats how the games began. This is my last year of High school, soon after I will move to Ft. Lauderdale and begin my Transportation Design Degree. After graduating there I will have to move to Pasadena and attend Art Center College of Design where I will get my masters degree in TD. I want to move back to Europe and work for one of the European car companies, but who knows maybe one of the US companies will change my mind. Way to early to tell. I hope that this will start a whole new chapter and business in mine and my dads life. He has a Cabinet shop here locally. We have never built any cars before this and we learned as we went for the past 1.5 years we learned so much, fiberglass, metal work, tons of engine, suspension etc and we continue to learn. We are happy with the outcome and glad people like it. He hopes this will be the start to a business change for him and my family. While wotkin on the car we did some bodywork for local individuals who heard about the car. It was a great sight, 3 cars infront of a cabinet shop getting body work done and then going to shows. We did from small repairs to major surgery. It was fun.! Witht the great experience we learned now anything is possible and anybodies ideas can be a reality. We learned that anything is possible..! 2. a family friend Fransisco Vilalba, a Equadorian native who told me, anyone can make a copy of something, it may look good but it never is the real car, make something from your imagination, something unique, something nobody has. 4. We learned that anything is possible..! The best four lines I've read in a long time and from a guy who's 19. Keep up the good work. 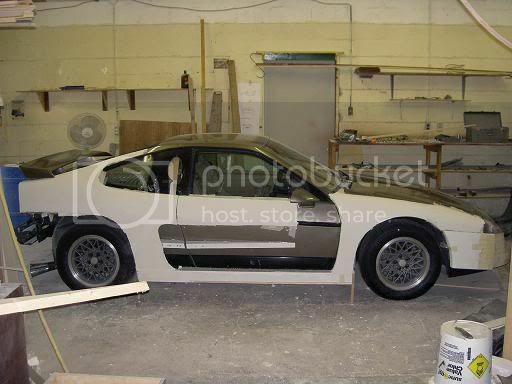 No doubt your second project Fiero would be out of this world! Here are some of the car before the major surgery. This should be a good read! Great car by the way, both you and you dad should be proud. Thanks for taking the time to make this thread it will be enjoyed by many I am sure. A + for you! 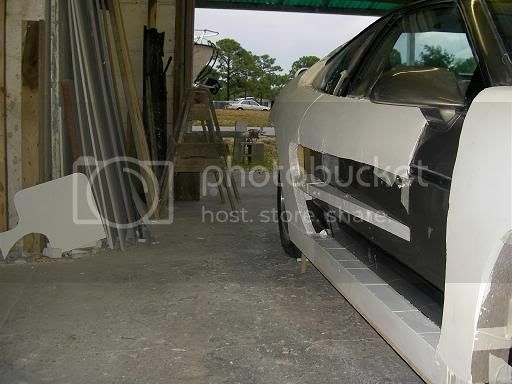 Now for the body plug stage: We put the car in the back of my dads shop and it all started there. This process was mostly used on the rockers, rear quarters and doors. The wood ribs were filled in with Home Depot wall insulating styrofoam, the large 4x8 sheets, that cost $6. The total styrofoam for the whole car was about 2 sheets, thats right $12. Welcome and Beautiful Car, Great work you and your dad did. Can you tell me where and what did the Gas Cap/ Cover come off of. I look forward to reading the build-up on your car. Great work on the car. Seeing your car answered a lot of questions that I had about mods to my own car. Keep up the good work, by the time your 29 you should have your own car line. If you make a kit for sale from your car, you just sold one. Oh I missed this too. Do we have any "PIP" experts here ? I tried to help Alex set pip up, his set up doesn't seem to be working right. It's been so long since I download it. Don't remember how. Like i said in the other thread. That is the new best looking Fiero i have ever seen. You've done a great job. And i second what troyboy said, if you ever make a kit from your car for sale thats the one i would buy over any other. Keep them pictures coming. Alex, you and your dad did an amazing job. I was the one speaking with you about your engine specifically. Thanks I'm glad people liked it. I still have some plans for it and maybe then, next year she will get the Best of Show unless someone surprises me..
What some of you may notice is that fact that the fenders are different in these original pics. What happened was when it was originally designed I did not think about the whole lamdo door option. Them I changed my mind, and another thing that change was the level of the splitter, on the doors, of the scoops. Thanks Dave i did some searching and found that photobucket actually has a feature that will automatically post it as an image. Thanks again and if I need more help I know you know how things work. yes beautiful work.. where did u score the gas cap cover for your car???? a+ from me ...tim..
YOU HAVE MY COMPLETE AND UNDIVIDED ATTENTION! wow, simply wow. Awsome job keeping it under cover. Pictures don't do this car justice...It was absolutely beautiful. The bar has been raised again. Alex, It was a pleasure to meet you and talk to you about your car. I know you must have been tired of answering the same questions about 100 times. It's great to see a young man with such talent and interest in cars. The future is bright for you, maybe a Plazma replica for your next project?? Its probably his firewall. If it times out that is probably the problem. He will need to add PIP to the exception list. Wow... what blast from the past! I too am watching this thread closely! Wow! Amazing! Big + from me! Where are those seats from? And is that Archie's dash? some of their seats are close to the same size as stock. They fit well and I love the harness wholes for the 3-4-5 harnesses. Do you have some "hours of work done" ?? So NOW that the car is done...Yeah I know they are never "done"
I know all the work I have done has cost me losing somewhere around 5 girlfriends in the build up period! I never saw the engine? pics?? I think I will do that along with the build thread, the majority of the pictures will probably put in a album type of page so they can all be in one place as well as in this topic. Hello Revin, I am glad its almost done. There are litle things that will be done to it for next year but i don;t know if I want to disclose that yet. Anyway we have the engine department covered already. Every add on goody is there and she will scream when we get to break her it, afterall she only has about 2-5 miles on her. Yep looks like a fast eng. 2-5 miles!?!? get on it and get some bugs on your paint !! put some miles on it and fly!